The New York Yankees are the top-ranked team in Box-Toppers’ 2019 preseason rankings, rising from second place at the end of the 2018 season. The 2018 World Series-champion Boston Red Sox fall from first at the end of last season to second place in the 2019 preseason rankings. Meanwhile, the Cincinnati Reds made the biggest offseason improvement in players’ accumulated Box-Toppers points, while the Arizona Diamondbacks had the biggest decline. Rockies pitcher Kyle Freeland is Tuesday’s Box-Toppers Player of the Day in the National League Wild Card Game. Freeland struck out six over 6 2/3 scoreless innings, allowing four hits and one walk, in the 2-1, 13-inning win over the Cubs, as the Rockies advance to the NL Division Series Thursday against the Brewers. The Colorado Rockies visit the Chicago Cubs in the National League one-game Wild Card playoff game Tuesday. 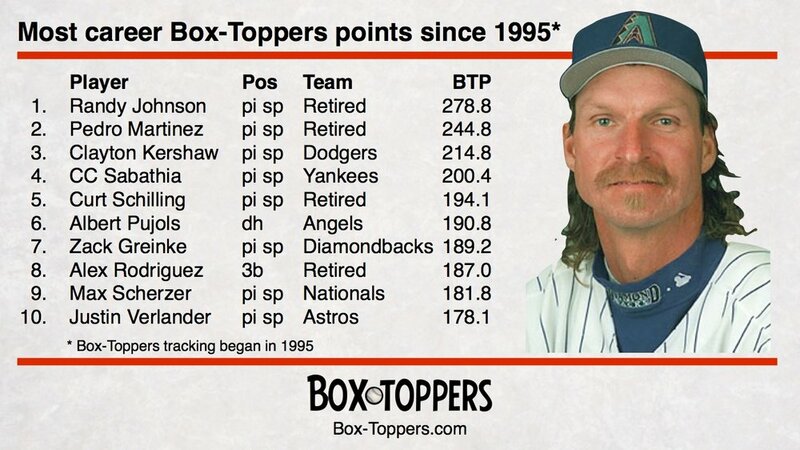 Cubs pitcher Jon Lester is Saturday’s Box-Toppers Player of the Day. Lester struck out nine over seven scoreless innings, allowing two hits and two walks, in the 1-0 win over the Reds. Jose Bautista of the Mets is Thursday’s Box-Toppers Player of the Day. Bautista hit a grand slam and doubled, going 3-for-4, scoring three times and driving in seven runs, in the 24-4 win over the Phillies. Indians pitcher Carlos Carrasco is Wednesday’s Box-Toppers Player of the Day. Carrasco struck out 10 over 7 1/3 scoreless innings, allowing four hits and no walks, in the 2-0 win over the Twins. Nationals pitcher Tanner Roark is Wednesday’s Box-Toppers Player of the Day. Also Wednesday, Indians pitcher Trevor Bauer rises to 10th place in Box-Toppers season player rankings after earning American League Player of the Day honors. Mariners pitcher James Paxton is the most deserving player not selected to the 2018 Major League Baseball All-Star teams. Paxton has 14.0 Box-Toppers points in 2018, fifth among all players and fourth among American League pitchers. Yankees pitcher Domingo German is Tuesday’s Box-Toppers Player of the Day. Also Tuesday, Twins pitcher Jose Berrios maintains his third-place spot in Box-Toppers season player rankings after earning Player of the Game honors. Royals pitcher Danny Duffy is Saturday’s Box-Toppers Player of the Day. Duffy struck out 10 over seven scoreless innings, allowing three hits and three walks, in the 2-0 win over the Athletics. Cardinals pitcher Michael Wacha is Sunday’s Box-Toppers Player of the Day. Wacha struck out eight over eight scoreless innings, allowing one hit and two walks, in the 5-0 win over the Pirates. Wacha had a no-hitter intact until giving up his first and only hit in the ninth inning. Red Sox pitcher Chris Sale is Tuesday’s Box-Toppers Player of the Day. Sale struck out nine over 7 2/3 innings, allowing two runs (one earned), four hits and two walks, in the 4-2 win over the Rays. Mets pitcher Jacob deGrom is Friday’s Box-Toppers Player of the Day. Also Friday, Astros pitcher Charlie Morton rises to third place in Box-Toppers season player rankings after earning American League Player of the Day honors.